“It is a struggle to have food daily. My parents have no source of income, so finding money to buy the food we need is a challenge,” she says.Presently three out of four Zambians live in poverty and more than half of them are extremely poor and unable to meet their minimum nutritional needs.Life is not easy for 36 year old Winfredah Chilala who lives in Simumpobela village in Monze.She struggles to survive on less than a dollar every day.Putting food on the table is a challenge.The nearest source of water is several kilometers away, so is the nearest health facility.As a visually impaired person, with no means to earn a living, Winfredah says life is hard.Winfredah is one of the estimated 80% of rural women who live in poverty.Poverty in her world, however, goes far beyond income poverty. It means having to walk over 10 kilometers to collect her Anti –Retro-Viral Drugs (ARVs) monthly and sometimes quarterly, depending on her CD4 count. Even having three meals is a challenge. As a person living with HIV and taking ARVs she needs nutritious food to live a healthy life. She lives with her parents who work on other people’s fields for maize grain to feed the family. 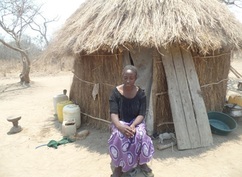 Winfredah has no decent house but lives in a shelter made of poles and grass.At her home, there is no toilet, and because she is blind, she relies on her nephews to take her to the nearby bush to the answer the call of nature. When her nephews are not around ,Winfredah has to hold herself and wait ,until someone can hold her by the hand and take her to the bush to relieve herself.She says the visually impaired are ostracized by society“Life is so difficult if you are blind, I became a different woman to my husband and his family when I lost my sight in 2008 after an illness,” Winfredah says.She said when she lost her sight, her husband told her he couldn’t be married to a blind woman and he sent her packing. She went back to her parent’s house with just her clothes, along with her son.Winfredah said her husband never wanted any form of contact with her again. Even calls to ask about her other son who remained behind made him so angry.“My former husband told me he wanted to remain with the youngest son, so I left with my older son ,it was a struggle at first for him to go to school ,now, a local priest is paying for him ,he is currently in high school”, she says. Before she lost her sight, Winfredah was a seamstress. Even after she lost her sight, she continued using the sewing machine for a while, making garments for sale in Mazabuka town.But several months down the line, her husband told her she needed to get out of his house, and he told her she couldn’t get the sewing machine.Life became difficult for a woman used to using her own hands to earn some income. Her parents are too poor to afford a sewing machine.Successive attempts to restore her sight after several eye surgeries failed.But she says she has accepted her disability and has not given up hope.“I don’t like begging. I have a skill. I can use a sewing machine. I need help to use my own ability to make ends meet. Begging on the streets is not an option for me”, she says When Radio Chikuni first aired Winfredah story, it caught the attention of Jonah Sialumano from Health Help Zambia.Mr Sialumano said Winfredah’s case provided an opportunity for her to receive help that would help her earn a living.“I always oppose the idea of charities and philanthropists giving fish to the disabled, you create a dependence syndrome and reinforce pity and helplessness. I encourage empowerment ,because it is sustainable, empower them to fish on their own, the only exception is when one has multiple disabilities and cannot do anything, if they can do something on their own ,let them do it,” he says. He visited her village thrice this year. The third time, Mr Sialumano visited Winfredah; he was with a trustee from Health Help International UK, Chris Byrne and his son Sam.Mr Byrne told me that he was appalled at the lack of social inclusion for the disabled.“People who are disabled need opportunities to use their ability,” he said.He said letting the disabled use their ability will reduce dependence and create a sense of pride for them as belonging and contributing to their communities.Mr Byrne said Zambia still has a long way to go to create an inclusive society.“The disabled should be helped to gain equal rights in society, there has to be an understanding of their needs and respect for their rights”, he said.Come next year, Winfredah will be leaving her dream of using a sewing machine to earn a living.Mr Byrne promised Winfredah a sewing machine, thread and all the materials she will need to start making garments for sell.The charity will also build her a house. Finally she will live in dignity, having been given a voice and the means to use her ability to make ends meet. Finally a fairytale. The Zambia Episcopal Conference has commended Catholic Radio Stations in Zambia for giving a platform to ordinary people in society. Speaking during a workshop in Lusaka, Director of Communications Bishop Moses Hamungole implored the Radio Stations to be impartial and accurate in their coverage of news. He urged them to remain focused and professional in their line of duty as the country heads to the polls on 11 August 2016. Bishop Hamungole also appealed to the Catholic Radio Stations to develop interest in reporting on how the Catholic Church is living its mission, especially during this year’s jubilee of Mercy. He further said that Radio Stations have the responsibility to help the church create the right environment for the weak and the poor, by informing them so that they make enlightened decisions. Livestock officer warns against the illegal movement of animals. Monze Senior Livestock Officer Phias Michelo Mungaila has advised farmers and traders against the illegal movement of livestock in the country. Mr Mungaila said most traders have been seen moving livestock without permits, which he says should not happen. The livestock officer said livestock permits should be obtained when moving livestock from camp to camp, district to district, province to province and from country to country. Recently there were reports of an unknown chicken disease outbreak in Mweene Community in Hatontola ward, West of Monze District which killed over 200 chickens in less than a month. The Senior Livestock Officer says there is likelihood that the chicken disease could be New Castle, a major killer disease of Chickens. Mr Mungaila said many livestock diseases such as East Coast Fever popularly known as corridor, have been endemic in Southern Province because of not following the right procedure when moving livestock. He appealed to farmers to submit correct figures of animals during livestock census in order to help authorities plan and acquire the required quantity of vaccines. The Livestock Officer further cautioned farmers against consuming animals suspected to have died as a result of infection. A corpse was recently found floating in a pond at Chisekesi abattoir in Monze District of Southern Province. The body was later identified as that of Ndumba Tembo in his 30s, who was last seen drinking the day before he met his fate at a known bar in Chisekesi. Relatives suspect no foul play and the body has since been buried. 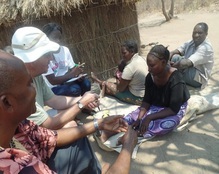 This information was made available to Radio Chikuni News by the Monze District Officer Commanding, Christopher Choobe. Meanwhile since January 2016 to date, Monze District has not recorded any deaths due to road traffic accidents. District Traffic Officer Chisanga says the district saw a rise in road traffic accidents in 2015 compared to 2014. Out of 133 road accidents in 2014, 18 fatal road traffic accidents were recorded in which 31 people died while in 2015, 19 fatal accidents were recorded with at least 24 casualties. Chief Hamaundu of the Tonga speaking people in Pemba District has predicted that Southern Province will be among the top provinces worst hit by hunger. The chief attributed this to the poor rainfall pattern experienced during the 2015 to 2016 farming season. He said this will make it difficult for people in rural areas to send their children to school as they mainly depend on farming for their livelihood. The traditional leader has however implored government to consider sending relief food to his village. Similarly, most people have complained of hunger in most parts of the province, citing among them the electronic voucher project under The Farmer Input Support Programme, which many say has contributed to the hunger situation where it is being implemented. The e-voucher scheme is a pilot project being implemented in 13 districts of the country. This project requires private agro-businesses to have an electronic register of farmers and to issue them with e-voucher cards to enable them access farming inputs in a transparent and expeditious manner. Most people say this pilot project has failed, as there are many irregularities which have affected many farmers. On the other hand, government recently instructed the Food Reserve Agency (FRA) to sale maize to farmers at a cheaper price in a bid to curb the hunger situation in the country. While most people have welcomed this move, others still feel it is still expensive to buy a 50 KG bag of maize as they still have to travel long distances. The Electoral Commission of Zambia (ECZ) has urged the media in the country to abide by the electoral code of conduct in this election year. Speaking during a Media Institute of Southern Africa (MISA) Zambia workshop for Community radio stations held in Lusaka, ECZ Senior Public Relations Officer Silvia Bwalya said the media should ensure that political players obey the electoral rules. Speaking during the same workshop, Independent Broadcasting Authority (IBA) Board Chairperson Brigadier General Justine Mutale, emphasized the role of the media in meeting developmental and communication needs of the communities they serve. Mr Mutale cautioned the media against irresponsible reporting which may incite violence. He urged media houses to be cautious of their use of language. The chairperson further said the Independent Broadcasting Authority expects all radio stations in the country to tolerate divergent views, report fairly, and show respect for human rights and freedoms. Zambia goes to the polls on 11 August 2016. Government has released 100 metric tons of relief food to Monze District in a bid to lessen the hunger situation. Speaking to Radio Chikuni News, District Commissioner (DC) Cyprian Hamanyanga says part of the maize will be food for work, while the other will be given to people who are unable to provide for themselves and these include the aged and persons with disabilities. Asked what will be done to ensure that the distribution is transparent, the DC said his office will closely monitor the distribution process so that the intended people receive the maize. The DC also made mention that the maize will be distributed as soon as they come up with modalities of distributing it. Meanwhile, Mr Hamanyanga told residents of Monze that the maize government decided to sale at K80 is not part of the 100 metric tons of relief food released. He however told farmers and affected residents that all the three constituencies in the district have selling points and people do not have to go to town to buy the maize. A resident of Monze District has called on the general public and market traders to conform to good hygienic practices during this year’s rainy season in order to avoid water borne diseases. Speaking in an interview with Radio Chikuni News, Doreen Habbenga a resident of Zambia compound and trader at Monze Main Market says people should ensure that they dig pit latrines and put up bins for easy disposal of waste. She adds that poor hygienic practices may lead to low productivity levels, high medical costs, low educational achievement and poor social development. The Jesuit Center for Theological Reflection (JCTR) in Monze has commended President Edgar Lungu for warning millers over the exploitation of customers. JCTR Coordinator Anthony Namatama told Radio Chikuni News that millers should not take advantage of the economic challenges Zambians are going through at the moment. Mr Namatama said there was no justification for millers to hike the prices of mealie meal, when they bought the maize at a cheap price from farmers. President Edgar Lungu recently cautioned millers across the country that Government will be compelled to introduce statutory price controls if millers continued to exploit consumers. The President further warned that Government might be forced to repossess some milling plants or eject milling firms from the market if they continued with this trend. Monze based Youth Activist Lloyd Siambeta has condemned the attack on Matero Member of parliament Miles Sampa by suspected Patriotic Front cadres at Kenneth Kaunda International Airport. Speaking in an interview with Radio Chikuni News, Mr. Siambeta described the attack as barbaric and detrimental to democracy. Mr Siambeta said the attack of Mr. Sampa might have happened in full view of police officers manning the airport but it is unfortunate that no one was arrested. He however urged police officers to be professional and bring the perpetrators to book. Meanwhile, President Edgar Lungu gave a directive that all those found guilty of inciting violence should be expelled from the party. The President said this when he recently addressed party members at Petauke Boarding School in Eastern Province of Zambia. Miyoba Vice Headman in Chief Moonze’s area of Southern Province, Jacob Mukwemba, has called for the review of the Grade 12 (G12) Clause in the recent Amended Republican Constitution. In an interview with Radio Chikuni news, Mr Mukwemba says the clause is discriminatory and will bar women from taking part in this year’s election. Article 162 states that a person qualifies to be elected as a Councillor or Member of Parliament if that person is not less than 19 years of age and has obtained a minimum academic qualification of a Grade 12 certificate or its equivalent. Meanwhile Zambia’s main opposition party, United Party for National Development (UPND) described the amendments as a sham and betrayal. Party President Hakainde Hichilema indicated that his party remained committed to the social contract it signed with Zambians in January 2015 to deliver the whole constitution through a referendum without tempering with its contents. Similarly Former Zambian Ambassador to the United States of America, Inonge Mbikusita Lewanika, condemned the introduction of this clause. President Edgar Lungu recently stated that Article 162 will not be altered in any way because it was voted for by the people of Zambia. The President assented to the Constitutional Bills on the 5th of January 2016. Two people of Maambo village in chief Hamaundu’s area of Pemba District were recently struck to death by lightening. Chikuni Radio’s citizen journalist Civic Mainda Mukuwa visited the scene and reports that this happened in their kitchen where Sharon Mwiinga and Eurita Milambo, 19 and 42 respectively, died on the spot. Village Headman Henry Lupapula confirmed the incident to Radio Chikuni News. Human Rights Activist Bright Jalila says marrying the August 11 general elections with the referendum on the Bill of Rights will confuse electorates. Mr Jalila who is also Executive Director for Positive Action on human Rights, Freedom and Development told Radio Chikuni News that the upward adjustment of the presidential, parliamentary and local government nomination fees by the Electoral Commission of Zambia (ECZ), is not only suspicious but also a deliberate move to exclude the financially incapacitated. The human rights activist added that ECZ is adequately funded and there is no justification they can give for this hike. He says this upward adjustment is abnormal because the Electoral Commission of Zambia does not raise money through nomination fees. Meanwhile Ubunthu Executive Director, Reuben Mbewe says the revised nomination fees are reasonable and timely, in that they would allow credible and visionary leaders with integrity to offer selfless leadership to the people of Zambia. Presidential candidates will now pay K 75, 000 (US$ 6600 ) from K10, 000 (US$ 880), Members of Parliament K10, 000 (US$ 880) from K5, 000 (US$ 440), Mayoral candidates K 10, 000 (US$ 880) , Council chairman K 5, 000 (US$ 440) and councilors in cities and municipal councils will pay K 2, 000 (US$ 176) while rural council nominations have been pegged at K1,500 (US$ 132).